Replacement control panel for SC2 , BlueBird, BlueBird XL and SC 3 kilns, simply to fit in minutes. We simplify high-temperature firings so you can immerse yourself in creating breathtaking ware. 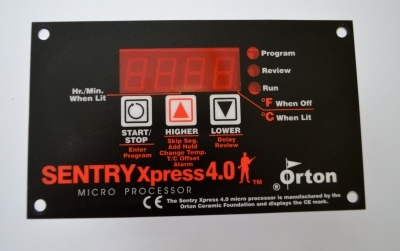 The powerful little Sentry Xpress version 4 micro processor is packed with features. On glass and jewellery kilns, the controller includes Single-Speed and 8-segment Ramp-Hold modes. Single-Speed mode is quick and easy for simple firings that need only one speed fired to one temperature. Choose from five speeds, and enter the temperature. Ramp-Hold mode lets you program custom firings with up to 8 steps, or segments. Fire thick, large glass pieces such as bowls and platters. Slow the cooling through the annealing range. Trade firing “recipes” with friends. Skip Segment skips past a segment during Ramp-Hold firing without having to stop the kiln to reprogram. Hold (soak) maintains a specific temperature in both Single-Speed and Ramp-Hold modes. Use hold for greater control of the final stage in fusing or slumping glass. Program the hold time needed for heat treating steel. Add Hold Time during firing in either mode without having to stop the kiln to reprogram. Change Target Temperature in Ramp-Hold during firing without having to stop the kiln to reprogram. Temperature Alarm can be programmed to sound when the kiln reaches a specific temperature. Set the alarm to remind yourself to check the kiln before the expected shutoff time so that you can watch the glass as it reaches its perfect stage of fusing. Storage Memory in Ramp-Hold mode can store 4 programs. Temperature Display throughout firing and cooling in your choice of °F or °C. Error Messages report mechanical problems such as a disconnected thermocouple, stuck relay, temporary power failure during firing, or a broken element. Delay programs a delay start time. Use Delay to turn on the kiln later to suit your schedule. Instruction Manual is written in plain English. This colorful, illustrated manual will guide you through each step. Quick Start Guide shows programming instructions for both firing modes. Place it on the wall near your kiln for easy reference. Quick Release Molex Connectors on the back of the controller permit fast removal without tools.